Discussion in 'Growing Marijuana Indoors' started by HerbsINtheBurbs, Jun 3, 2006. Edit: oh yeah, and they're in miracle grow potting mix (feeds plants up to 3 months) with some purlite mixed in evenly. Also, I'm going to be doing LST, vokal's method of weaving... and I was wondering at what height I should start the LST... or should I judge by nodes? Those are not the best ferts for vegging. You want the first number, nitrogen, to be higher. yeah I've since stopped using the 0-10-10 and only the 10-15-10... should I not use the 10-15-10 and go with another garden store variety npk with higher nitrogen? Depends on how long you plan to veg, but I would. Just a general purpose plant food should be only a few bucks at Wal-Mart, Home Depot, Ace, etc. Although the plant looks fine as is. The leaf bending should not be a concern as long as there is good coloration, no spotting, no wilting, etc. What kind of light are they under? 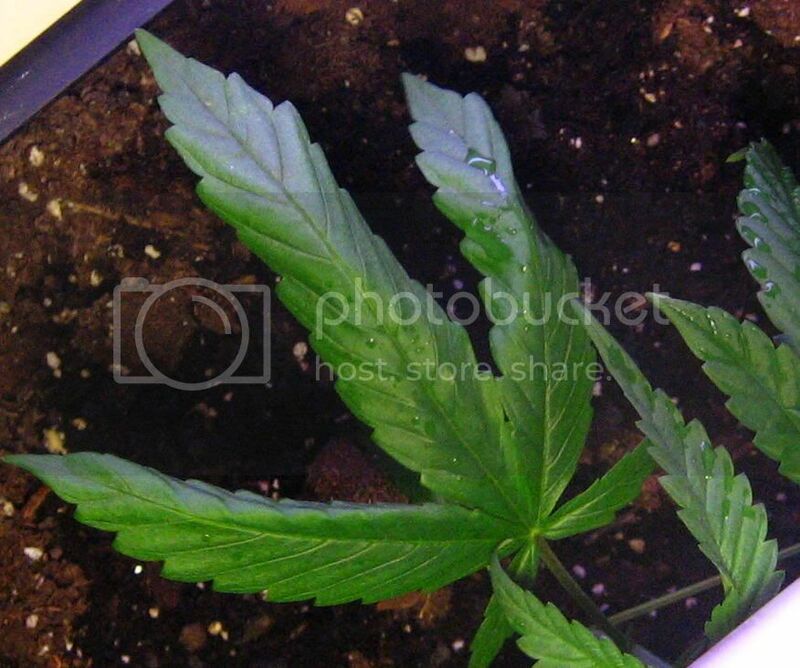 It looks in the photos like you had just watered because the soil has darker and lighter areas and also the leaves have droplets on them. Be careful about getting water on the leaves while under a HID light -- the droplets can act like magnifying glasses and burn the leaves. I have an aquatic grow-light at 800 lumens and a 1750 lumen gro-fluro I got at ace, as well as a CFL, 800 lumens. I did just water, and I spray down my leaves often to keep up humidity, and they have no burn spots or whatnot. The Schultz's plant food was among the general purpose plant foods you mentioned. its really essential that I have something like a 15-10-10 as opposed to my 10-15-10? hey i'm using the same exact soil.ive heard that mircle gro is bad on some fourm postings.then again ur plants look pretty good.the purple might be too much of something also.in consideration it is slow release fertalizer in the soil and in combination of putting more in it. 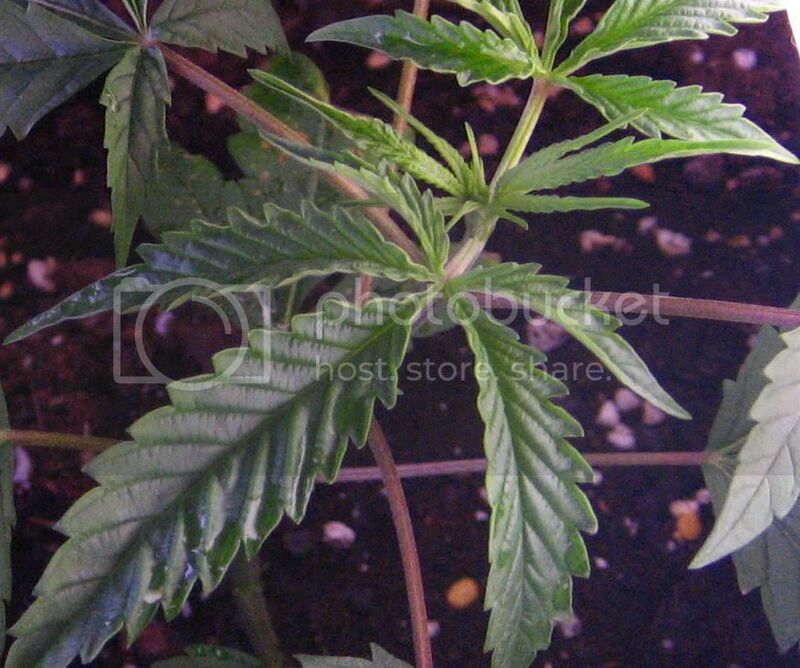 might want to worry about burning ur poor girls.especially under lights like that it happens to release more ferts from the soil that you're using.dont get me wrong i like mircle gro because im a sucker for laziness and fast growing plants.good luck buddy. and toasty, I wish I'd been told that before. I've been misting under the 400w hps and never thought about the possibiltiy of the water droplets magnifying the light and burning the leaves... doh!! I have been asked many times if it is true that water drops on plant leaves can lead to burning of the leaf tissue in strong sunshine. It is true that a water drop can act as a lens...... but in order for the sunlight to be focused on the surface of the foliage, the drop must be a perfect, rounded semi-circle. In common experience, you know that water droplets are flattened. Physicists know that the focal point of such a lens (if a focal point exists) is either above or below the leaf surface, not on it. Since light is never focused on the leaf cells, its diffuse energy is never enough to heat the cells to the point of damage. Another way to think of this is to consider that if the light DID focus on the leaf surface beneath the drop, the heat would cause the droplet to quickly evaporate....... before the cells could be damaged. Water damage CAN occur when the drop is dramatically colder or hotter than a leaf surface but the explanation that "the drops act as a magnifying glass and burn the leaf" should be relegated to the folk tale bin." Nodes/w pics at 25 days from seed ?? 23 days into veg w/ pics!! !